Wanna see a really, really faint object? Check out the tadpole shape, tail extending up and to the right. You’ll need to look at the very center in this image, taken with the 27-inch telescope at NEKAAL’s Farpoint Observatory. 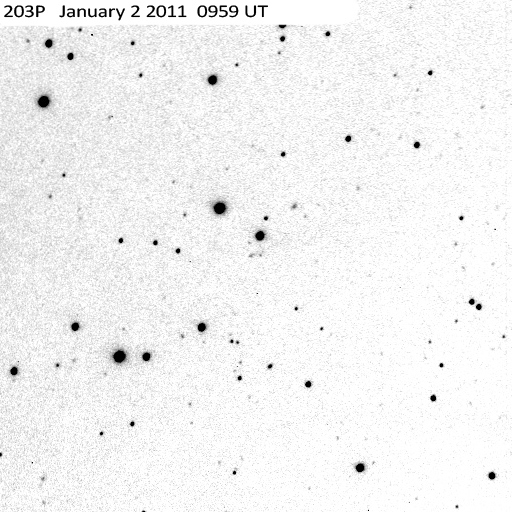 That’s comet 203P (Korlevich). Now, the “203” means it’s the 203rd comet of its type discovered. The “P” means it’s a periodic comet and will come around again, unless it runs into something, breaks up, etc. And “Korlevich” is the name of the discoverer, or the name of the astronomer who “recovered” it (determined that it is the same as a comet we’d seen before). This comet was discovered in 1999. That’s not very long ago–if you had seen taken this picture 13 years ago and reported that little smudge to the Minor Planet Center, your own name would be forever listed next to “Comet 203: Discoverer”! Note that this is a negative picture. Which does not mean it goes around complaining. It means that we’ve made the stars look black on a white background, rather than the way it really looks in the sky. Astronomers do this because it’s easier to see things on grainy pictures that way–especially if you’re in the observatory, at 3 in the morning, squinting at this image you just took. The telescope and camera collected light over a width of 27 inches–the pupil of your eye is about 0.2 inches. Sounds like a 135-fold advantage, but wait!–it’s a squared relation, making it a 18,000-fold advantage. Unfair. They stared at the comet for 15 minutes and without forgetting a single photon. Your eye’s persistence of vision is normally a fraction of a second. The whole picture is only about 1/5 of a degree on each edge. That’s about the same as the length of a grain of rice held at arm’s length. Even the very brightest stars in this picture (the biggest black spots) are much fainter than you could see with just your eyes. The camera operated at -50°C so that it didn’t get distracted by random infrared light. A neat trick, but we at NEKAAL just do not recommend you try this with your eyes! In case you missed this announcement, there is a astronomy-related event at KU on Feb 3rd. Details in the links below. I recently turned in my 3,000th NEO observation to the MPC. This puts Sandlot Observatory less than 1800 observations behind Farpoint’s total. I hope to surpass Farpoint’s total within the next couple of years..
Every January the Minor Planet Center starts designating the current year’s asteroid discoveries. In the past there has been a very non-official but fun competition to see who gets the year’s very 1st asteroid designation (this year it would be 2011 AA or K11A00A). Well this year is no different as I missed the first slot, but it was close as I received a designation for the 2nd and 3rd asteroids of the year 2011 AB and 2011 AC.